On average, 73 people were killed or seriously injured every day on Britain’s roads last year. Sadly, since 2011 there has been little improvement in reducing the number road deaths. If Britain had kept up with international targets, 2,549 deaths could have been avoided between 2010 and 2017. As well as the huge social cost, these deaths have a significant economic impact. Road crashes cost society £35bn each year - that’s more than is spent on primary education and GP services combined. To see just how risky the roads near you are, visit our interactive Dangerous Roads Map, created in partnership with the Road Safety Foundation (RSF). Together, we have also produced a report calling on the government to invest to make roads safer and save lives. Some roads are much riskier than others and half of all road deaths are concentrated on around 10% of the road network. These sections are around 50 times riskier than the safest sections. The danger is far greater on A roads than motorways. On average, single carriageway A roads have eight times the risk of motorways. The government put in place a £100 million in 2016 to upgrade 50 of England’s most dangerous local A-road sections, and the money is expected to prevent 1,450 fatal and serious injuries over the next 20 years. But road safety campaigners say more money is now needed. A single investment of £75 million on these roads is urgently needed, the report says, and would prevent an estimated 1,100 fatal and serious injuries over the next two decades. That would then need to be followed by £75 million each year for the following five years. The report identifies 40 persistently higher risk roads which had an average of at least one fatal or serious crash per mile along their length in the three years to 2016. 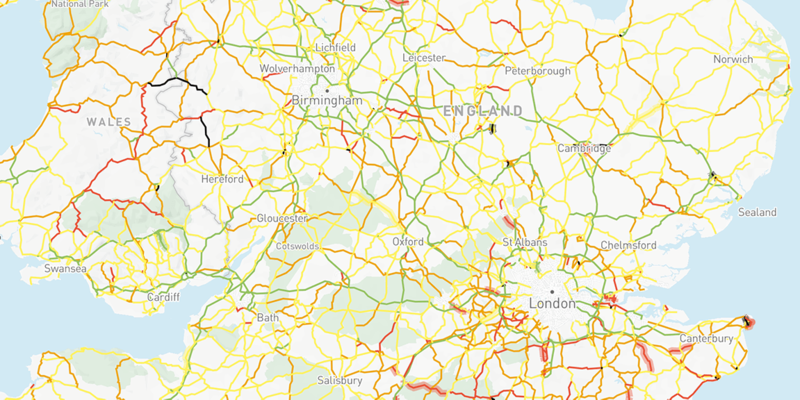 Of the top 10 persistently high-risk roads, four are in the South East, and there are two each in the East of England and the North West, with one each in Wales and the East Midlands. The South East is also home to the persistently highest risk road, the A254 between Margate and Ramsgate in Kent. This short section of road has worsened over the last three years with an average of seven fatal and serious crashes each year. A third of these involved a motorcyclist, almost half were at junctions, and almost as many involved pedestrians or cyclists.